During this time in 2015, I was grateful to have an article published on Fox News about the increasing prevalence of Type 2 diabetes in the U.S. I am re-posting this article in 2018 because the message has not changed. In 2015, there were 400 million people worldwide living with type 2, now just 3 years later it is estimated to have grown to 500 million. Between 1990 and 2010, the number of people living with diabetes within the US has more than tripled, and the number of new cases doubled every year. Why would this many people suddenly develop “insulin resistance”? It just doesn’t make sense. ARE WE BECOMING A NATION OF DIABETICS? 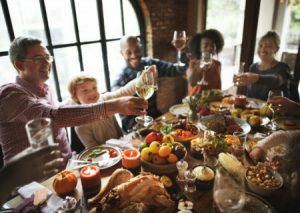 During the holidays, millions of Americans look forward to enjoying time with friends and family over big meals, parties, social outings, and drinks. We all want to have a good time and the last thing we want to think of is the result of overconsumption. But it’s time to wake up. America is becoming a nation of diabetics. To clarify from the start: I’m not referring to Type 1 diabetes, which is a hormonal disease, I’m talking about Type 2 diabetes, which is a lifestyle condition that now affects one in four adults over 65 in the U.S. with one in three over the age of 20 prediabetic. I have studied diabetes for over 20 years and based on my own experience as well as that of my patients’, I propose a simple alternative explanation: Type 2 diabetes is linked to the overconsumption of grains. By 2050, one-third of all Americans could suffer from Type 2 diabetes. The problem is severe—and expensive! The American Diabetes Association estimates that diabetes costs the American health care system more than $245 billion per year, in direct medical costs and reduced productivity. Worse, we can expect to spend billions of dollars more in health care costs for an increasing population of diabetics. The only way to stop this is to prevent the incidence of Type 2 diabetes. Medical experts claim that the prevention of Type 2 diabetes is possible if people adhere to dieting and exercise. Although this sounds logical, it has proven to be ineffective for two reasons. First, people are simply confused about what diets to follow and 80% of them fail (although Americans spent $46.3 billion a year in weight loss products). Second, exercise burns very few calories relative to one’s daily intake. Neither walking 3.5 miles in one hour, riding a bike for 10 to 12 miles in one hour, nor running 30 minutes at a speed of 7.5 mph burns just half the calories in an average American diet of 1,800 or 2,000 calories per day. Furthermore, once we hit 45 or 50, there is also a gradual decrease in the ability to maintain skeletal muscle function and mass, so exercise is even harder for most adults. In order to prevent Type 2 diabetes, we need a new approach based on what diabetes really is. Endocrinologists insist that “insulin resistance” in three sites in the body – muscle, fat, and liver cells — causes Type 2 diabetes, but even after 80 years of research, we still do not have a test to measure insulin resistance. Plus, how logical is it that some cells in your body mysteriously become resistant to insulin while others don’t? We all know that our bodies are like hybrid cars. We can either burn glucose or fat. When people overeat grains and grain-based products, their fat cells fill with fatty acids as their body converts all that excess dietary glucose ingested through the carbohydrate rich grains to fat. At some point, your fat cells are full and can no longer accept more fatty acids. In response, your muscles start to burn fatty acids and the glucose in your body is not burned and remains in your bloodstream, leading to high blood sugar and Type 2 diabetes. The “fatty acid burn theory” is far more logical and can explain many anomalies about Type 2 diabetes, such as why thin people can also develop it (as they too have only a finite number of fat cells), why not every obese person develops diabetes (some obese people have more fat storage than others), and why some ethnicities of people are more prone to it (their ancestry influences their fat cell allocation). What this means is that Type 2 diabetes is not some mysterious disease or pandemic, it is a lifestyle condition that can be prevented and even reversed. As we go into this holiday season, I therefore issue a call to the National Institute of Health, and all health care professionals, to re-examine the link between grains, weight gain, and high blood sugar. And I urge the American public to take responsibility for your health instead of buying into outdated theories supported by forces that do not have your best interest at heart (including the personal agenda of pharmaceutical companies and the government’s subsidization of grain production). Get educated. It’s your life! If you want to avoid gaining weight and risk the onset of Type 2 diabetes or seek to reverse your diabetes and get off your medications, reduce your consumption of grains and see what happens. No need to count carbs, measure or weigh your food, or follow strict diets. Just cut down on your overconsumption of bread, pasta, pizza, donuts, muffins, cookies, pies and cakes, and instead really taste, chew, and enjoy your holiday meal in the company of your loved ones. My informative yet easy to use book will guide you or a loved one to reverse Type 2 Diabetes in 8 weeks. My plan will also help you to remain diabetes free as you will take this on as a lifestyle. Make better choices and take ownership of your health today! Then tell a friend!! PreviousPrevious post:Avoid The Temptation To Overeat During The HolidaysNextNext post:Why Is The Insulin Resistance Conspiracy So Prevalent?